You may recognize her from greeting cards. Maybe you remember the dolls and toys. You may not know, however, that Strawberry Shortcake was also - for a brief time - a disco diva. She relates the whole story on the 1980 album "Strawberry Shortcake: Live." It's all there: from her hopeful journey (by snail-drawn cart) to New York City to her glitzy gig at the Big Apple Disco. Then she decides to pack it all up and go home. Why? On the album, she claims she got homesick for her berry patch, but I suspect that's just a rationalization to boost her bruised ego. Most likely, her fans turned on her. 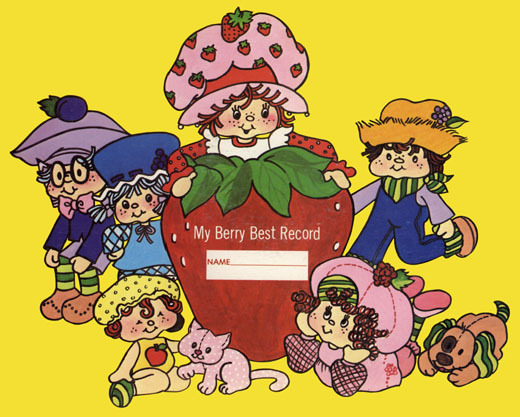 I just don't think the world was ready for the unique singing style of Strawberry Shortcake. But you, dear visitor of this site? I think you're ready! For starters, there's "New York, New York." This song bears the distinction of being the only place on the album where you'll hear the city referred to as anything other than "The Big Apple." On "Strawberry Rap," Ms. Shortcake seems a bit confused, as if she thought "rap" was some sort of dance. Although I suppose the definition of rap was more flexible back in 1980, as it was still more or less in its infancy. Who knows? If she kept at it, maybe the rappers of today would aspire to sound like this. Oh, and though I didn't include it here, she also sings Kool and the Gang's "Celebration." Just so you know. Certainly the arrival of this recording heralded the end of Disco. This recording makes me want to hurt myself. I should never have tried to listen to this before leaving for work. All day I had voices in my head shrieking: "Say straw, straw. say STRAWBERRY RAP! STRAWBERRY RAP!" To me, Strawberry sounds an awful lot like Little Marcy. So, before carting off to class, I was stuck with the mental image of this creepy little puppet getting down with Liza Minelli at Studio 54. My wager is that, around 1980, Little Marcy suffered a crisis of faith after Little girl thingy died (from starvation- Marc' forgot to sit by the fire and give her some food), and decided to do some soul-searching. After hitchhiking across the country, Marcy found herself in NYC during the tail end of the disco craze. In a cocaine-induced stupor, Marcy created this stream-of-consciousness album, with the help of an amusement park recording booth (and a Casio keyboard). Three days after the album's public release, Little Marcy (alias Strawberry Shortcake) woke up under a shopping cart in a Bradlee's parking lot. So, can anyone help me decipher the line that comes after "Ap-ray, Erry-bay / I can say it any way"? I've been listening to this for months and it still sounds like unintelligible squealing to me. It would seem that she's squaking. "i'm wrapping up my rap because the band is gonna play!!!!"